ALIENWOLF is a painter—each song is another landscape, spacescape, soundscape. From the dark, iridescent corners of “ALIENPLANET” to the flashy, jazzy chords on “Clouds of Marz,” ALIENWOLF creates scenes with his music. Melodies that sprawl ancient ruins of bass and rhythm amid clouds of cosmic guitar chords are the style for this album. 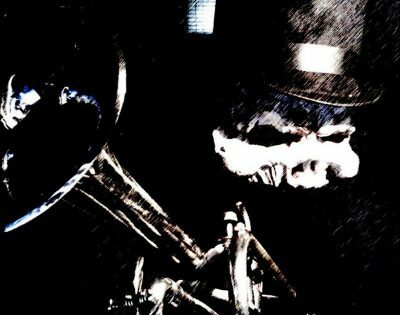 ALIENWOLF is the solo project of one very talented, trumpet-wielding, New Orleans native turned Salt Lake City performer. Terrific trumpet solos and tearin’ guitar licks highlight this album, distinguishing ALIENWOLF as a skilled musician. For a man who dresses like it’s Halloween all of the time, ALIENWOLF’s music is actually quite relaxed. There’s a sense that his sounds are ongoing, regardless of whether you’re tuned in and listening. It’s like each song is the soundtrack you’d hear sitting on an alien planet dreamed up in the musical fancies of ALIENWOLF. “ALIENPLANET,” un-ironically, is an excellent example of this, as sound effects and atmosphere replace guitar melodies and cosmic fuzz to help bring the album to a close. Some of ALIENWOLF’s songs could use a little work with the equalizer, as the lead can get lost within the current mix. Take “March of the Skeletons,” for example—the guitar is throwing down a fresh lead, but it’s too hard to hear it through the mix, and the song comes off a little muddy as a result. ALIENWOLF wields each instrument deftly, but his skill is occasionally undermined by the number of sounds going on in his music.